We offer the opportunity to learn new crafts and skills from a team of experienced makers and tutors. We provide affordable and inclusive courses to support you from beginner level to independent project work. Our mission is to help people discover what they can make and what they can do, to enable them to experience the flow of making by hand and the feeling of achievement having made something useful and tangible. Our teaching workshop is based in the vibrant St Pauls area of Bristol, within the St Pauls Learning Centre and is open to everyone who wants to get making. Book and pay online – The quickest and easiest way to book a place is directly on our website. Payment is by PayPal. Book and pay in person – You can enrol in person at The Makershed and pay by card, cheque or cash. Please ring us on 07599 670365 to make arrangements for your visit. Book and pay by post – You can post a cheque to The Makershed along with your name and the details of the course you would like to book. Your booking will only be processed if there are spaces available when we receive your cheque. The St Pauls Learning Centre encourages use of public transport and arriving by foot/on a bike. We are a 15 minute walk from the bus station and a 25minute walk from Temple Meads train station. The number 5 bus Denbigh Street stop is the closet to us. If you are cycling, there are bike stands outside the centre where you can lock your bike up. Or you can pick up a YoBike from anywhere in the city and cycle here for just £1. This amazing cycle sharing scheme was launched in 2017 and we’ve already seen lots of bright yellow bikes parked nearby. Go to yobike.co.uk for more information. 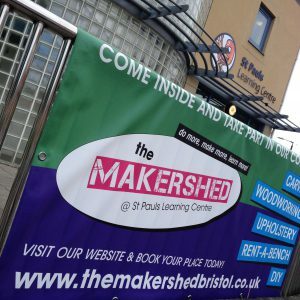 The Makershed is situated inside the St Pauls Learning Centre. Go in through the main entrance and follow the walkway around to the right, through the double doors. Turn immediately left once you’re through the doors, exit the building and you will see the Makershed next to the main hall. The reception in the centre is not always manned so please don’t wait there, just come straight through to the workshop. The St Pauls Learning Centre telephone number is 0117 914 5470. Please wear comfortable clothing that you don’t mind getting dirty and sturdy shoes with enclosed toes. Upcycling projects do not need to be brought in until half way through the course. They can then be stored at the Makershed for the remainder of the course. If you are with us for the whole day then you are welcome to bring and eat lunch in the workshop. Lunch break will be 12.30 – 1pm. There is also a Caribbean cafe in the St Pauls Learning Centre. Glen’s Kitchen is open 7 days a week serving breakfast, lunch and dinner. Glen offers a range of meals including English and Caribbean cuisine. If you’re lucky enough to be here on a Wednesday you can try a fantastic roast lunch. Many of our courses are project based and of a length of time that we would reasonably expect the average person to take to complete that project, plus a little extra. Everyone will inevitably work at different speeds so if you find that your project is taking longer than the course allows we will do our best to fit you in for extra classes that will enable you to finish. You will need to agree the number of classes required with your tutor and then contact us either by email or phone to book. If you are in receipt of any the income-related benefits listed below and choose a midweek daytime course, you are entitled to apply for a concession fee. Concessions are available on course fees only and do not apply to materials. To apply for a concession you will need to provide evidence of your benefit entitlement. This can be done by emailing or texting a photo or scan of the relevant document. We will then send you a concession coupon code to use when you make your booking online. Evidence can also be provided in person at The Makershed but please ring us first to make arrangements for your visit. Our courses are aimed at adults but we do allow young people over the age of 14 to attend provided they they are accompanied by an appropriate adult. 1.6 if you are booking for someone under the age of 18 years then an appropriate adult is required to be present on The Makershed premises with that person at all times and to sign The Makershed Liability Disclaimer before the course starts. The Makershed is committed to the provision of a learning and making environment where everyone is treated equally and with respect and consideration. We do not tolerate discriminatory behaviour or harassment of any kind, including any expression which aims to incite discrimination or hatred against any person or group, especially on the basis of race, religion, sexual orientation, gender, disability or socio-economic background. By booking a course you acknowledge and accept our equalities policy and our right to cancel your booking if your behaviour whilst at The Makershed is not in line with this policy. The activities in which you may participate as part of your course or independent working at The Makershed and subsequent and related activities off the Makershed premises (Makershed Activities) carry the risk of injury and damage to property. 1.2 you agree not to bring any claim against The Makershed.